…so on this page I will present some good ideas on what to buy as a gift for someone who plays the trumpet, or brass players in general. A nice looking, funny, trumpet player figurine for your trumpet playing friend to put on the shelf in his practice room. This could be a cool trumpet player gift. Trumpet players love to arrive at the gig wearing “special” trumpet accessories, or something than points out that, not only is he a trumpet player, but he also LIVES the trumpet lifestyle. Few things could achieve that feeling better than wearing, special, trumpet cufflinks. This could indeed be a wonderful present for a trumpet player. If you are looking for a trumpet player gift then ask yourself this, “Would my friend like to decorate a part of his or her house with this?”. If the answer is “yes” then you just found yourself a suitable present. Having trouble knowing what to buy as a gift for your brass playing friend? Perhaps a trumpet holder that he can put on one of the walls in his house could be a good gift idea? It always makes the practice session easier to start if the trumpet is right in front of you instead of locked in, inside the trumpet case. This is a good trumpet player gift as it can be used on gigs as well as in everyday life. Like I already mentioned, nothing makes a trumpeter more proud than having something that amplifies his identity. This is a personal favorite of mine because it is an EXACT replica of a real trumpet, accurate down to the smallest detail. We brass players love that. …even if he doesn’t then it’s still convenient owning several because we like to have one in our trumpet case to bring to our gigs and rehearsals, and one permanently on the floor in the practice room. The K&M are the best brand when in comes to trumpet stands and your friend would for sure appreciate this present. This is just such a good gift for a trumpet player. The necktie speaks for itself and I think 99,9% of people playing a trumpet would love to wear this to a gig. I don’t think it’s possible to go wrong here. The most inexpensive gift to buy for a trumpet player, yet something very useful that he or she will surely appreciate. The chop saver lip balm helps the lips recover after a long and taxing practice session and it really makes a difference. I’m speaking from experience here. For just a few buck this could be a good present for a brass player. This is could be a very good gift idea for someone who plays the trumpet or a cornet. This silver brooch is made in Germany. 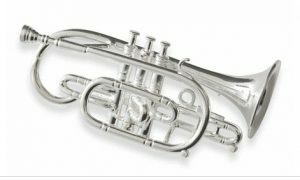 The major cornet brooch will add a touch of fantasy to your brass player friend. …until he or she get’s one as a present from you. The bucket mute is loads of fun and will surely be appreciated and put to god use for years to come. This nice looking tie clip is made out of brass. Kind of fitting to buy as a present for your brass playing friend. It just might be a huge success. Does your musician friend like to cook? If so this could be a cool thing to buy for him or her. It features a jazz trumpet player with sunglasses, playing an expressive piece of music. As a trumpet player myself I would LOVE to get this as a gift for my birthday. A medieval trumpet to have on the wall in my practice room. Note, the trumpet is, of course, not an original as, unfortunately, you won’t find many of those anymore. It does not matter if your friend already has a trumpet cleaning kit because this is something we always need to buy more of, as the old one wear out. This could be a good gift to buy for a trumpet player because it is practical and useful, unlike jewelry. If your are worried about buying something for your musician friend because he or she may already own it then this could be an option IF he or she lives in a house with several rooms. Personally I like to have several music stands and I have three different ones in my own house. No need to constantly move them around when I want to practice in another room. Portable yet sturdy for traveling, school or home. Carrying bag and note clamp. Even though I already have a gig bag that can hold three trumpets I would LOVE to get this as a Christmas present, for example. It’s a very nice looking gig bag and I would use it for some of my gigs when I only have to use one horn. I’m willing to bet that your friend, husband, wife or child feel the same way. This device is called PETE, which stands for “personal embouchure training device”. It is a gadget that the brass player can carry around in his pocket and every so often during the day train his lip strength. It’s a fantastic way to keep the strength in the face muscles when not having access to the trumpet. Use it in school, at job or whenever you cant get to your horn. …but, it would be a wonderful gift for someone who is just starting out, or for someone who only has a couple of years of playing under their belt. The music included lets you play the songs with a professional backup band so learning and practicing are cooler than ever. The BERP is a cool little device that you attach to the leadpipe of the trumpet. It is used when the trumpeter wants to practice on the mouthpiece alone. I use the BERP on a daily basis myself and I can highly recommend it. Don’t worry if you do not get the idea behind it, your trumpet playing friend will, of that I’m sure! …If so then this could be the perfect gift. It is a trumpet valve guard made of real leather and it will protect the trumpet from stains and wear from the hand. You see, after playing the trumpet for a couple of months-years the lacquer where you keep your hand starts to wear off. This does not happen if you use a valve guard. …if you are unsure and in doubt. Go for this one. I can guarantee it will be a success! Every brass player loves to experiment with their sound and equipment. This is a mouthpiece booster that you put over the mouthpiece and it will affect the way your trumpet sound. It will also make the feel a bit different and this is something that can improve the playing for some people. Is your friend someone who likes to test and try out news things? If so, this could be the right item to buy for him or her. …yes, playing exercises out of this book is that important. This is a cool invention and very useful for brass players. I can take myself as an example here. When I play my exercises, using a normal metronome, I really have a hard time hearing the “beep beep beep”. The trumpet is a loud instrument and I can not use the full dynamic range of my instrument if I want to hear the beats…. …so it forces me to play all the trumpet exercises at a soft volume. This is limiting and to be avoided. With this clever gadget the problem is solved because it uses sound AND vibration on the wrist. It could indeed be a cool present to buy for someone who plays a brass instrument. This is a great tuner because it is specially designed for trumpet or cornets. It uses the vibration from the bell to tell you where the pitch is. The benefits of this is that you can use it during, for example, band rehearsals without the instruments around you disturbing the tuner with their sound. This is not possible with normal tuners. A great gift idea for someone who plays the trumpet. …this despite the fact that I only played on professional trumpets the Last 25 years. 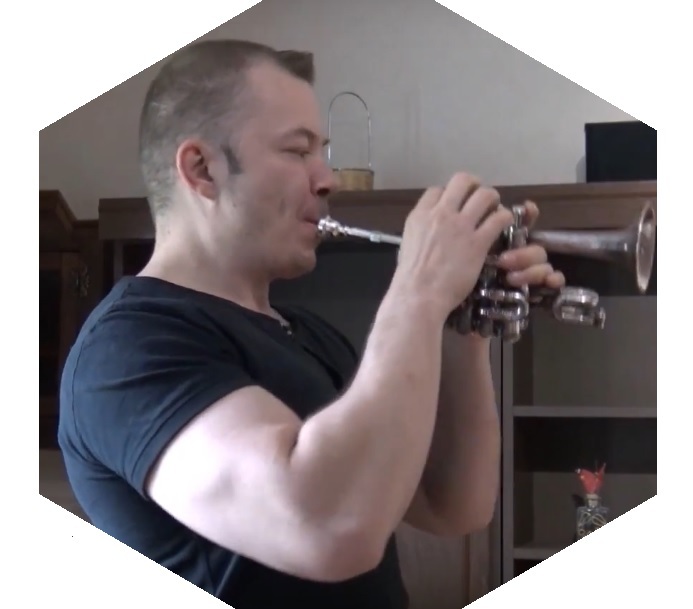 Yes, I was that impressed with the Jean Paul TR-430 trumpet. I write more about this in the article what is the best beginner trumpets. For just a little more than 300 bucks this horn actually plays like a pro horn somewhere around 900-1300 bucks. So, as I said, This could be a very good upgrade for someone who started out on a beginner horn that perhaps was old and not that fun to play on. Thank you for reading and good luck with your present. P.S. Are you a trumpeter reading this article? 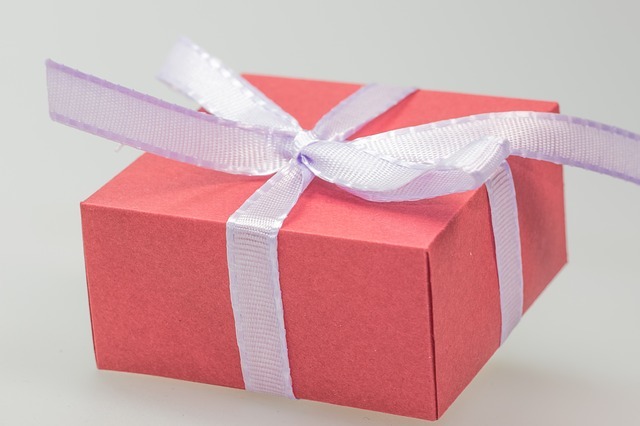 If so, what is the best trumpet present you ever received? Please feel free to leave a few comments in the comment section down below and let me and the rest of the readers know because it could really help. Previous Previous post: Playing Trumpet With a Mustache-Does Facial Hair Help or Hurt?